When you’re doing any sort of maintenance on your bicycle, gravity is the enemy. It’s really difficult to pull parts, troubleshoot an issue, or even perform a basic tune-up without elevating the bike. You’ve probably noticed that most bike shops have these big stands that clamp around the seatpost. They make life so much easier! You might be surprised to know that it’s pretty easy to find a good, affordable bicycle repair stand that’s close to pro quality. Not all stands are made equal, but there are some cheap gems if you do your research. I’ve used a bunch of stands in my life as both a cyclist and bike mechanic. Some were great, and some frankly sucked. 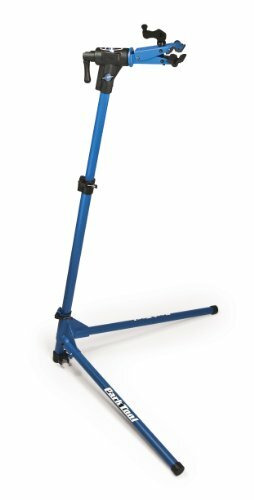 This article is written to help any cyclist searching for a well-priced cycle work stand for repairs and tune-ups. Ready? Let’s roll! Should I Build a DIY Bike Repair Stand? Is It Cheaper? I hate to burst your bubble, but every DIY bicycle work stand project I’ve seen has ended up costing almost as much as a store-bought item. They’re often less versatile too. Some even cause frame damage. Yikes! That’s not to dissuade you from being creative. If you’ve got a plan, go for it! Just be 100% sure that it won’t cause damage to your bike. One suggestion: if you go the DIY route, save yourself some hassle and at least buy a pre-built bike repair stand clamp. It’s a way easier route. Pros: Great brand, foldable and adjustable, very stable, reasonable price. Cons: Not quite as durable as the pro quality bike stands from Park Tools, but more than adequate for home use. Step into any bike shop and there’s a good chance you’ll see an iconic blue and black stand in the repair area. Professionals swear by Park Tools stands. Their pro-quality line is expensive. 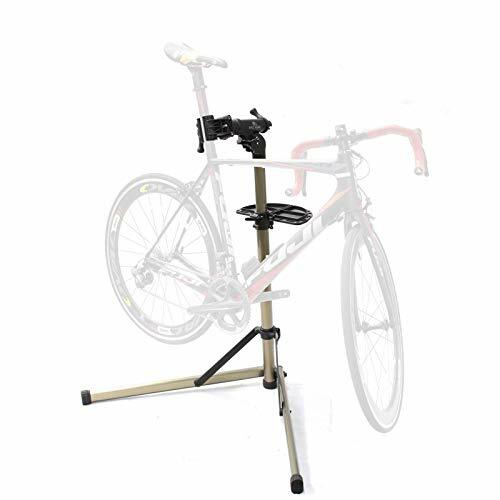 However, Park Tools has recognized the demand for a more affordable bike stand for home mechanics, and the PCS-10 is the result. Despite that portability, it’s a very stable stand, with twin legs that provide a steady three-points of contact. Even with a fairly heavy bike it inspires confidence. The cam-style clamp can fit almost any frame tubing, and the head rotates 360 degrees to attach to seatpost or seat tube. The clamp itself is pressure adjustable setting to mitigate frame damage. It features several quick-release clamps so you can adjust the height on the fly. Available for well under $200, the powerful PCS-10 is a well-built bargain. It’s an almost pro-quality bicycle maintenance stand that I’d consider before anything else. Pros: Highly stable on all surfaces, almost indestructible, great price tag, good brand. Cons: Fixed height clamp, spinner knob isn’t convenient to tighten. If there’s one thing to know about the Feedback Sports recreational bike stand, it’s this: it can take a beating. It’s a dirt simple and highly affordable bike maintenance stand that will last through years of use and abuse. The frame is made from sturdy steel. Not light, but strong! It’s rated for bikes up to at least 60 pounds. If you’ve got a bruiser of a mountain bike, this might be the best stand for you. The dual legs are attached to the frame. When you want to fold it up, you just remove the pin and swing the legs up. The clamp head also folds down, making it pretty easy to stash in the corner of a closet. It has some play to it when set up, but don’t worry, it’s highly stable. One thing I love about this stand is its ability to work on uneven surfaces. I’ve used it on concrete floors and dirt roads, and it always seems rock solid. 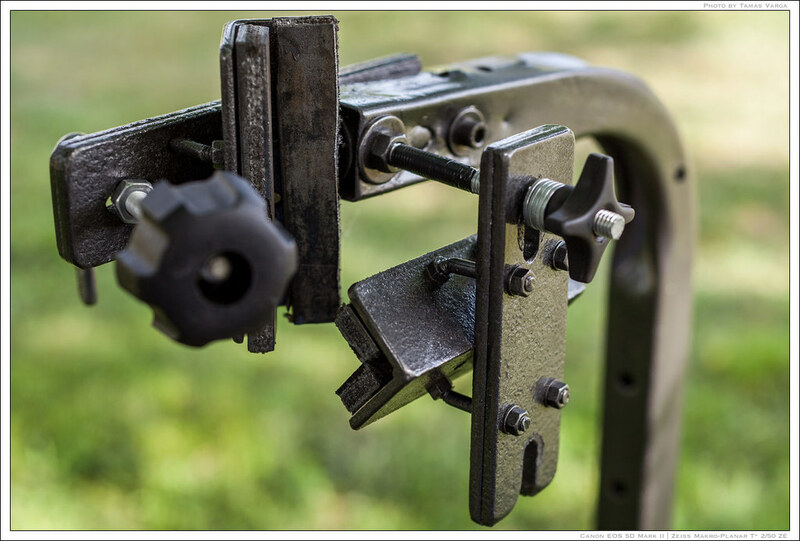 The clamp can be rotated 360 degrees, so it’s great for clamping onto any part of the frame. My only beefs: the clamp is at a fixed height, and it has a spinner knob to tighten, which is a bit time consuming. Really, though, these are very minor concerns. The price tag is excellent too, sitting at around $125 at the time of writing. It’s one of my favourite bicycle repair stands and it has great reviews all around. Definitely check this puppy out! Pros: Magnetized tray is awesom, folds up to tiny size, durable. Cons: Flat legs might lack stability on some surfaces. I’m a sucker for unique, helpful features. Bikehand’s folding bicycle maintenance stand has a huge one. A magnetized built-in tool rack and tray holds all your tools, bolts, bits and pieces, all within reaching distance. Beyond that neat selling feature, this stand is impressive. It’s built to withstand the rigours of regular use. All of the stress points are reinforced. It’s made from aluminum alloy, making it a bit lighter. It sits on a two-piece leg system and it’s remarkably stable for a folder. This stand is simply tiny when folded up. The head tilts down and the legs slide up. It’ll easily fit in the trunk of a car, or a closet. A quick release clamp on the neck allows you to adjust the height to perfection. The clamp head rotates 360 degrees too, so you can use it with virtually any bike. 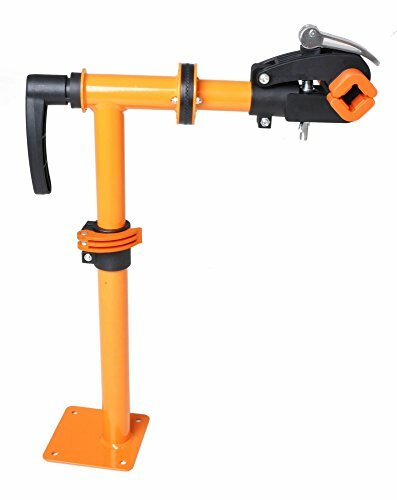 Even though it’s the least expensive one on this list, the Bikehand is one of the top bike repair stands, with rave reviews from mechanics and home hobbyists alike. Budget-sensitive mechanics should lean this way. Pros: Extreme stability, super durability, portable and foldable, included carry case. Cons: Expensive, but I know a few pro shops that use this exact stand. It’s a beast. 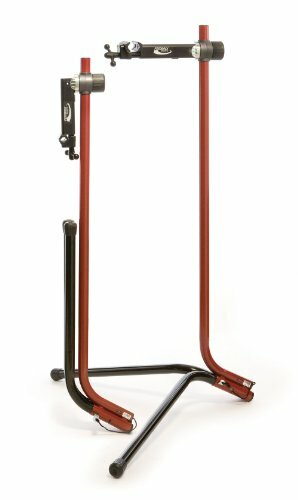 A true beast, the Topeak PrepStand is durable, sturdy and stable, capable of securing virtually any bike you throw at it. The frame is aluminum, while the head itself is steel. Unlike many of the other ‘leaning tripod’ styles, this one features three legs which extend out in each direction. Another great feature of the PrepStand is the adjustability. Quick release clamps let you change the height on the fly, and the long head rotates 360 degrees. An interesting feature: the head has a digital scale; very hand if you’re trying to shave a few grams. It also comes with a carry bag, which is great for storing it away or transporting it from place to place. The PrepStand is a very portable, highly durable cycle maintenance work stand that’ll survive a bomb blast. It’s the least affordable, but otherwise what more could you ask for? Got a workbench? Here’s a money-saving alternative. If you have a workbench in your shop and you don’t mind sacrificing portability, a fantastic way to save money is to install a bench-mounted bicycle repair clamp. They cost a lot less than a full stand, and if installed properly they’re every bit as effective. Just be aware that sometimes the ability to move around is pretty valuable, especially if you don’t have a ton of space in your workshop to begin with. Put some thought into where you decide to install. If you have a workbench already and it makes sense for you, I’d definitely forego buying a full stand and just get a good, sturdy clamp instead. Another alternative is the wall mount bicycle repair stand. It’s a similar idea (and price tag), with the clamp extending out from the wall itself. It all just depends on your space and what you have to work with! This is another thing I hear a lot. There are a bunch of cheaper stands hitting the market. A few years ago you wouldn’t find anything in that price range, but now it’s flooded. 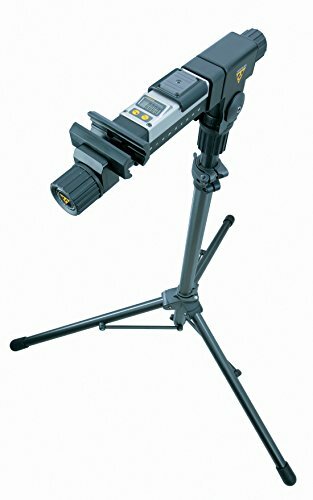 Here’s where I’m at: I’ve seen a couple of these ultra cheap stands up close, and I have major concerns. The problem is stress points. If your major stress points are made from cheap plastic rather than solid metal or sturdy resin, you’re going to have problems. Something will break sooner or later, and that stand will be worthless. Or worse, it’ll fail while you’re working on your bike. You might luck out and find something that holds together. However, I’d personally rather invest a bit more cash and have a bulletproof bicycle maintenance stand from a trusted brand that’ll last me for many years. Each of the ones reviewed above fall into that category. Again, it’s just my two cents! 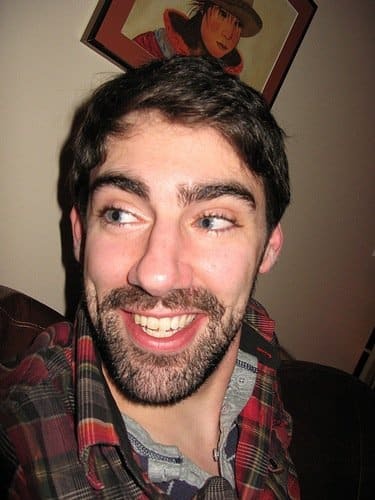 Professional Bike Mechanic Having built and repaired bikes for the last 4 years — in both a professional and a hobby capacity — Will is enthusiastic about cycling in all its forms, but particularly fixies and urban bikes. Living in beautiful Vancouver BC, Will gets out and cycles whenever he can. Current ride: a Norco XFR. Having done some initial research for a stand and also not wanting to spend much money I too was curious about the ebay/amazon cheapo stands. Any further experience or knowledge of them since writing this article? Also, one ParkTool stand that stood out was the slightly cheaper model the PCS-9, any experience with this stand? What’s the Best Leather Bicycle Saddle on a Budget? Why Does My Bicycle Chain Keep Clicking? What’s the Best Type of Bicycle for Exercise?